NOVO2 Lounge Bar is the perfect place to rest or for business and social meetings. 4 meeting rooms with natural light overlooking to the Parliament. Central location with easy access to tourist attractions. We stayed at this hotel last week for 3 nights,we had a great time! A special thanks to the manager Robert who arranged a surprise for my birthday, that was really a great start of our stay! :-) The location was perfect: a quiet location, we had breakfast with magnificant view over the Parliament and we were at a few minutes walk to Fishermans bastion, the castle and Margherite island. A metro stop just around the corner with quick access to all the wonderful places Budapest has to offer! After a whole day (and night) visiting the city it was nice to "come home" to a clean and spacious room, we would totally recommend this hotel! Enjoyed the services. Happy with the facilities. we had enjoyed the view but there was nothing special. There were several good things about this 7 night stay: location opposite parliament, next to the Danube and also near to useful things like trams, metro and supermarket; the housekeeping staff were very good; pillow choice was very good; a really nice touch was the herbal teas in the room; the breakfast was fine if international business travel standard. The minus points were : the first room I was given had a water leak which the hotel should have known about and no help was offered to move to the satisfactory new room, I had to repack and move myself; the view from the room was spoilt by a failure to have the windows cleaned and the curtains hung the wrong way round so as to block some of the view; the carpets were shabby;and the front desk staff were not helpful in booking restaurants and shows, fortunately google came to the rescue.Value overall was goid but I would have paid more for a better experience. Quite good location, amazing breakfest, amazing serivce. I opted to not clean my room , it was mentioned they will empty bins with that but they did nit empty bins , on other day after room service they did not even bother to refill shampoo and soap,I have to call them and request to refill . 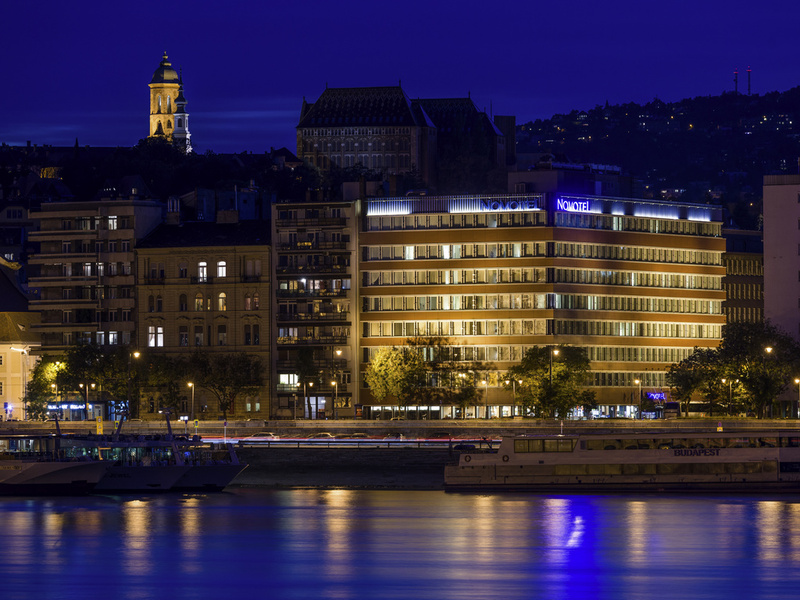 The Novotel Budapest Danube has the most beautiful view of the Hotels near to the Parlament. On top of it, the service is amazing with employees totally motivated to attend the customers and always trying to delight us. Staff very helpful when asked for recommendations for food places and day trips. Food was very nice from the hotel restaurant. The hotel had all the right facilities and services to ensure a very pleasant and comfortable experience. I was delighted with everything during my stay, from the ease of check in, perfect room with a view and the time taken to provide activities and pencils for my children. This is definitely the best Novotel we have stayed in so far and cannot wait to come back soon. Good hotel, good location for my work and also for transport within Budapest. Good hotel, large, good location. Room was spacious and clean. Hotel restaurant very comfortable, with great views. Very good breakfast. Dinner: rather limited choice and on the expensive side, but very good waiters. The worst part: only one lift was working at the time, and for a large hotel this seems too little. Great location, super service, great food. My experience could only have been improved by a room with river view.